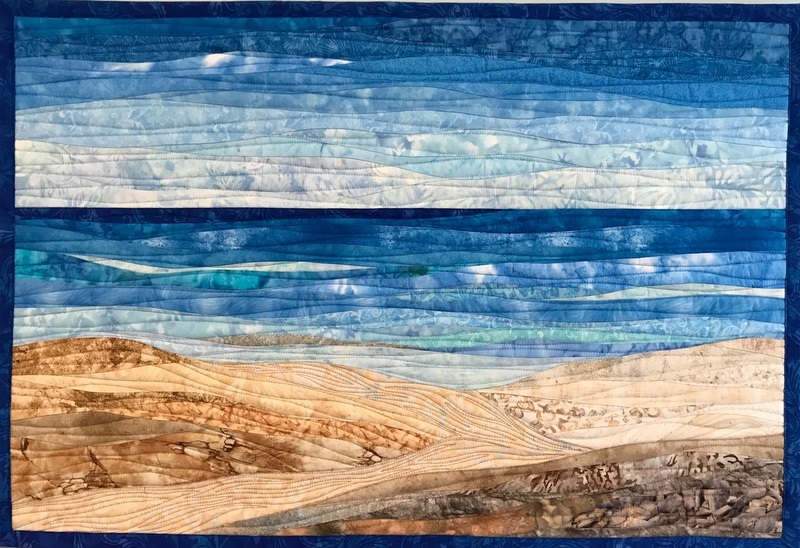 I recently finished Ocean with Dunes 15, a seascape art quilt. As the number on this quilt indicates, I have done 14 previous DUNES quilts, each a bit different. I don’t use patterns and every art quilt is one of a kind. Additionally, I like to try new ideas. In this quilt I used a wider variety of shades of sand fabrics to try to create depth and perspective in the dunes in the foreground. Through my piecing, I also created a walk in the sand through the dunes, again with careful fabric selection and distinctive quilt stitching so the path is easily distinguished from the rest of the dunes. I love trying new fabrics, as I did with this art quilt for both the dunes and the water. The strips of pale blue fabrics in the water create cresting waves and look almost white against the brilliant blues. Curved strip piecing is such fun! It truly is like painting with fabric! Don’t forget to step back and look at your quilts as you create them to get the full effect of how the colors are blending.